Kantenna Kennels put a lot of time and resources into the breeding, feeding, rearing and care of their puppies. Breeding firstly for themselves and secondly for family pets. We focus on producing puppies that are sound and stable of mind and body in our breeding selections. Early socialising and training will help you to help your puppy grow to become a responsible member of the community. We encourage all new puppy owners to attend obedience training classes. We evaluate each puppy's personality and match new owners lifestyle as best we can with puppies temperament, to ensure your new puppy is right for you and you are the right family for the puppy. Kantenna puppies are fed a super premium diet. They are Registered, Pedigreed, Vaccinated, DNA Parentage Proven and Micro-chipped, they are regulary wormed and come with a comprehensive diet chart and ongoing lifetime support. We also provide a 'Health Contract' against hereditary disease and information on rearing and training so that your GSD will be a sound happy member of your family. 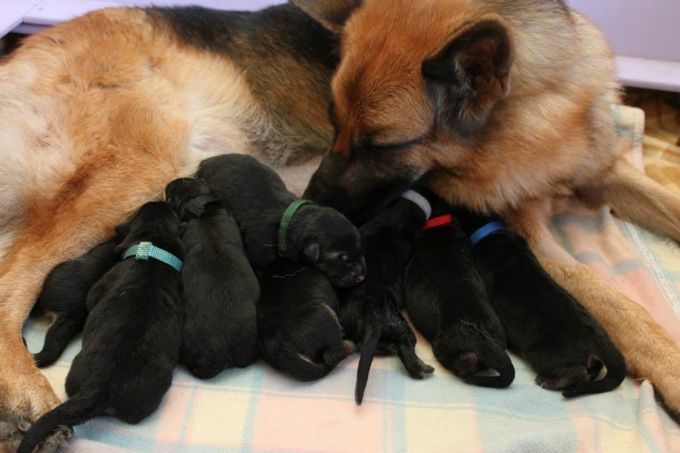 All Kantenna puppies are bred from parents who have been successfully classified under the GSDCA Breed Survey Scheme.